Dean took me to see the production of Jesus Christ Superstar last night at The Whiting Auditorium in Flint, MI. I had seen the movie years ago, and in high school our choir did (almost) the entire show, so I knew the music. IT WAS AWESOME! 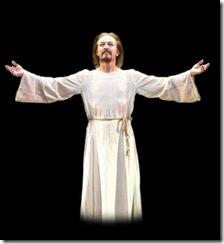 Ted Neeley starred in the original movie, and he is in the production now as Jesus. His performance was absolutely amazing. He’s almost twice the age that Jesus was when He died, but the acting and singing was spectacular, and he received a lot of standing ovations and loud applause. Judas was played by James Delisco who has a phenomenal voice. He’s a newcomer to national tours, but you will see him much more often, I’m sure. The show has been updated somewhat to reflect modern times. If you are able to catch this in a performance near you, it is well worth the cost (which wasn’t bad, I might add). I found myself in tears in parts of the show, and seeing it during the season of Lent made it even that much more of an impact. Oh, I would LOVE to see that! It was a favorite of mine in high school. I had the album and just about wore it out! It is an amazing show I’m sure. I wonder if it is coming to Detroit area?Glad you got to see it Caron! Diana, I tried to send you an email, but you don’t have a public profile and no way to contact you other than this. JCS was at the Fox Theater yesterday… two shows. Too bad you missed it! Hi Caron, I saw the original play, oh that ages me! It was fabulous with all the strob lights and the hippy dancers.It’s always been one of my favorites because the music just did it for me.